We are seeing growth in the number of people that are earning some sort of income from their machine. Some people are selling their own products as a side business, some people are taking custom orders, and others have started full time businesses and are earning their living with X-Carve, Easel, and Easel Pro. It has been very inspiring to meet these people and learn more about their journeys. I got the opportunity to meet Steve and Debbie Lee of 8th Line Creations. We interviewed them and made this short video to help tell their story. Debbie had been an accountant for 32 years. She lost her job and had to decide if she would get another accounting job or try something new. She decided she wanted to explore starting her own woodworking business. She looked at machines ranging from the 500mm X-Carve to more industrial type machines that were as much as $20,000 or more made by other manufacturers. A big factor for Debbie was how long it would take her to pay of the machine. Since the cost of the 500mm X-Carve was about $999 she calculated that with her income from making products it had the lowest risk and shortest pay back period. When I talked to Debbie she said it took her about 4 months to pay it off. Debbie's story is inspiring however not everyone has an accounting background. I think it's important for everyone to have an opportunity to get an X-Carve. We found a finanical partner who is helping us to make this happen called Affirm. I've known the founder of Affirm for about 12 years. Prior to starting Affirm he started PayPal. 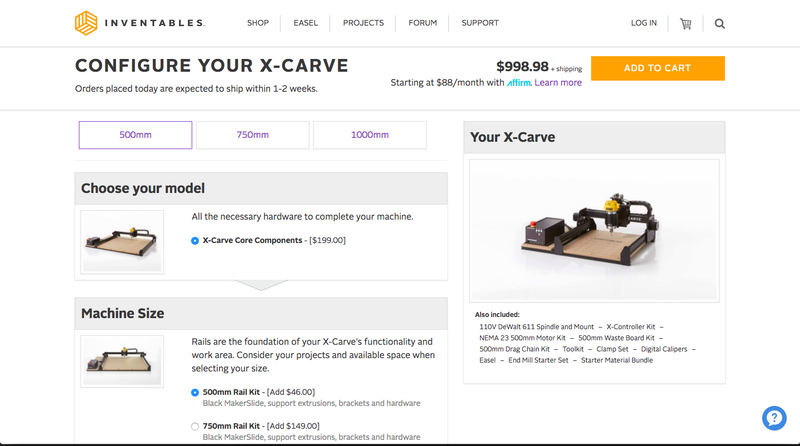 Last week we announced a way to pay for X-Carve monthly through Affirm. I like the approach Affirm takes with customers. Affirm is a financing alternative to credit cards and other credit-payment products. Affirm offers instant financing for online purchases to be paid in fixed monthly installments over 3, 6, or 12 months. The idea is you can buy and receive your X-Carve, and pay for it over several months. This payment option allows you to split the price of your purchase into fixed payment amounts that fit your monthly budget. If Affirm approves your loan, you'll see your loan terms before you make your purchase. See exactly how much you owe each month, the number of payments you must make, and the total amount of interest you’ll pay over the course of the loan. There are no hidden fees. This was one of the things that attracted us to Affirm. The corresponding finance charge is the only fee associated with an Affirm loan - they don’t charge late fees, service fees, prepayment fees, or any other hidden fees. They strive always to be more transparent and fair than any other form of financing. At Inventables we value transparency so we really liked that they are taking this approach. Over the years we've had a lot of people explain that they can't order from Inventables because they don't have a credit card. Until now we didn't have a good option for you. 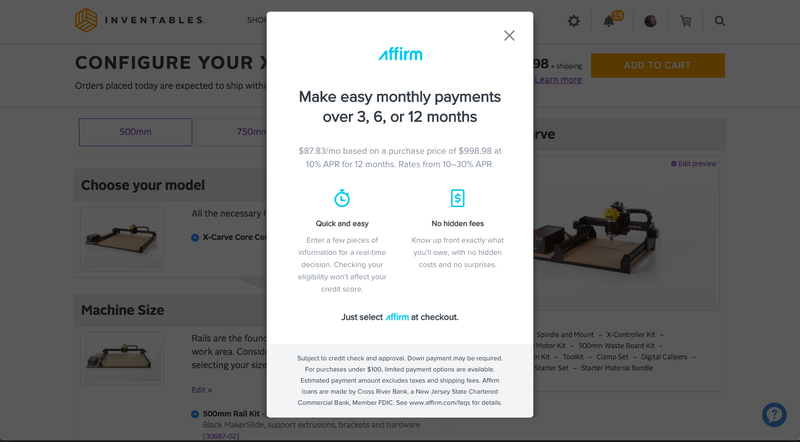 With Affirm you don’t need a credit card to make a purchase. Here's an example from the size machine that Debbie purchased. 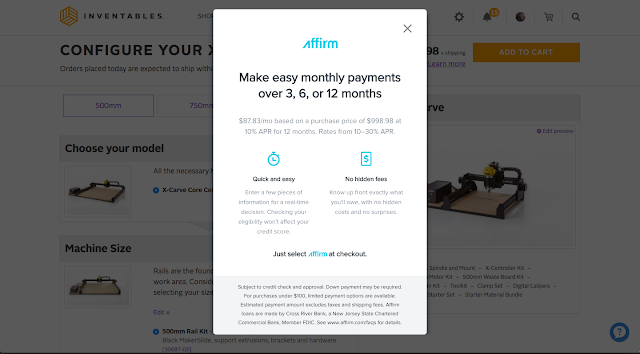 The retail price of the machine is $998.98 however you can see below the price it says "Starting at $88/month with Affirm Learn more"
If you register with Affirm they will ask you a few questions and calculate the amount you would need to pay for your X-Carve each month. We hope people who are buying the machine for business purposes are able to make more money each month than the payment they owe Affirm for the machine. Remember paying a monthly fee is not a guarantee of success. However, we hope this approach to paying for X-Carve in smaller payments rather than up front enables more people to start their own businesses. Currently, Affirm is available only to shoppers residing in the United States. Affirm hopes to expand its services to customers outside the U.S. in the future. We'll make an announcement if and when that happens. We put together a more detailed FAQ with information about this form of payment. I understand this way to pay is not for everyone. We don't want people to get into a situation where they can't pay for their machine. We also understand that financing is a complicated topic and could create stress for some folks. If you feel uncomfortable with monthly payment plans or financing I don't want you to use this method of payment. For those of you who do feel comfortable with a monthly payment plan I'd encourage you to check to see what your monthly payment would be to see if you can afford to pay for the X-Carve on a monthly basis rather than all up front.